The Rock’s I Quit match against Mankind at Royal Rumble 1999 was one of the most memorable and easily one of the most brutal matches in both men’s careers. 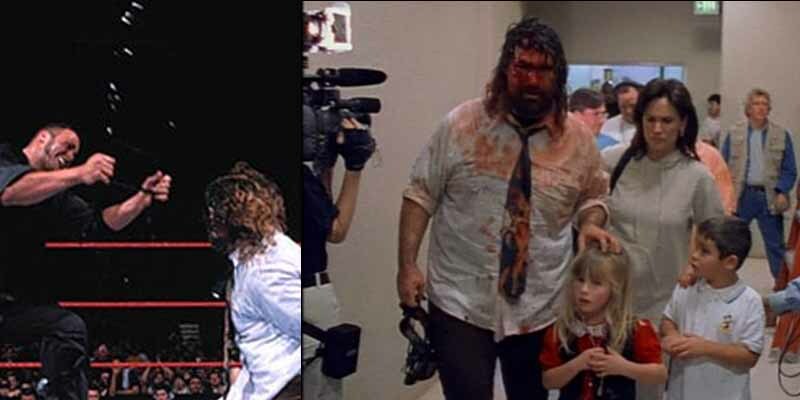 The one fact that unintentionally helped sell the brutality was The Rock cuffing Foley’s hand behind his back and hitting him with repeated unprotected chairshots to the head, about 10 in total, making his wife and kids legitimately worried. Foley said in two of his books that he wasn’t happy with The Rock for getting carried away like that. The Rock eventually apologized and learned from his youthful mistake, but it’s safe to say PG WWE will not be replaying the footage too often. Unprotected chairshots are a big no-no nowadays (especially after the Chris Benoit tragedy), let alone 10 back to back.